“Here’s an eagle, on the horizon to the left of Sauratown,” All eyes turn in that direction but see nothing, even through 10x binoculars. Eagle-eye Scott Depue saw it though, and now calmly adds, “don’t worry, its coming right to us; you’ll see it.” Sure enough, a big bird slowly comes into view for everyone, and sure enough it is a Bald Eagle with white head and tail glistening in the sun. We marvel at the majestic bird and at Scott’s legend eyesight. Regular observers at the Pilot Mountain Hawk Watch affectionately refer to him as “Hubble” after the space telescope. 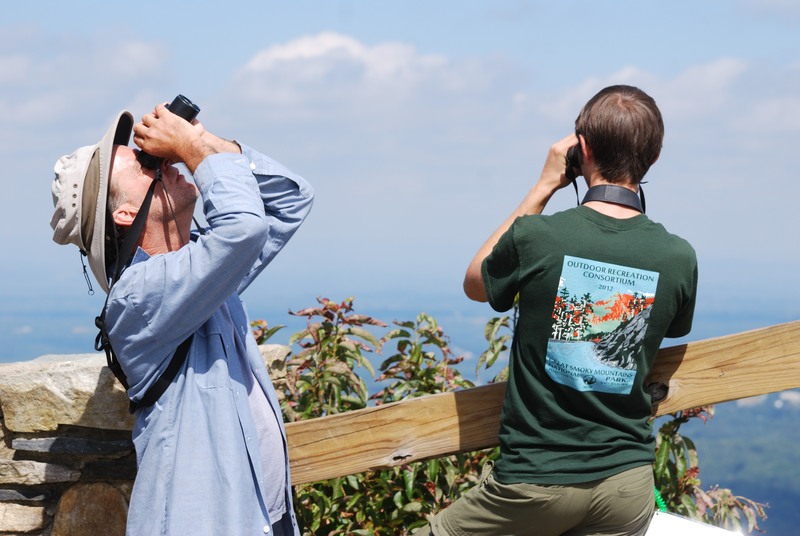 Every September, bird lovers make the pilgrimage to Pilot Mountain to watch migrating raptors. Most of them are Broad-winged Hawks, which travel from their northern nesting areas all the way to Central and South America. They follow the Appalachian ridgeline and pick up the west coast of the Gulf of Mexico. Observers may only see one or two “broad-wings” at a time, but these birds often travel in large flocks or “kettles” as they spiral up on thermals, find a stream of air and effortlessly gliding a few miles before they repeat the process. Broad-wings aren’t the only migrating birds of prey. 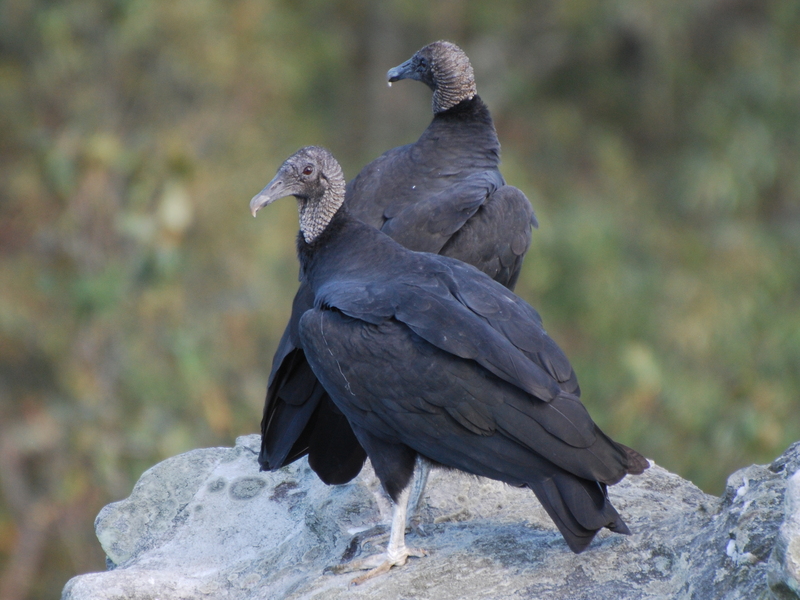 At Pilot, watchers can find up to 11 species of hawk, falcon or eagle, plus both Turkey and Black Vultures. The mountain is registered as an official watch site with the Hawk Migration Association of North America (HMANA). For about 40 years, Pilot Mountain volunteers have submitted migration data to the HMANA database at www.hawkcount.org, along with observers from dozens of other locations along the Appalachians and around the country. Sunday morning, September 22, was sunny and cool with a light breeze from the northeast. It was quite a change from the fog and rain of the previous day, when no raptor in its right mind would have been flying much less seen from Pilot’s Little Pinnacle. Mike Conway, Mike Tove and I were there by 10 a.m., and we were expecting a good day. Broad-wings like to move after a cold front blows through, and the conditions were ripe. We just didn’t know how really spectacular the day would prove to be. Even on good days, the 10-11 a.m. hour can be uneventful because the heat thermals have yet to develop. However, this morning we had 19 broad-wings in these first few minutes, plus close-up views of a Peregrine Falcon flying by the knob. The falcons are amazing to watch, and their numbers are steadily growing after the species was nearly extirpated from North America in the early 1970s. After 11 a.m., things really began to heat up, with thermals rising and broad-wings flying. 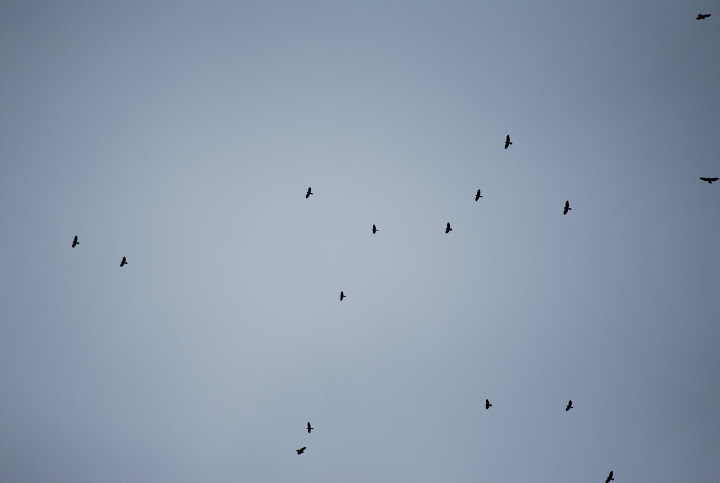 For the next six hours, the broad-wings spiraled upward several times in “kettles” of 200 birds or more then streamed high overhead toward the southwest. Some were “nasty,” as Scott refers to distant specks above the horizons. Others provided great views close and straight overhead. From time to time 13 Ospreys, 11 Bald Eagles, a couple of Northern Harriers and another Peregrine Falcon distracted us from the main event. 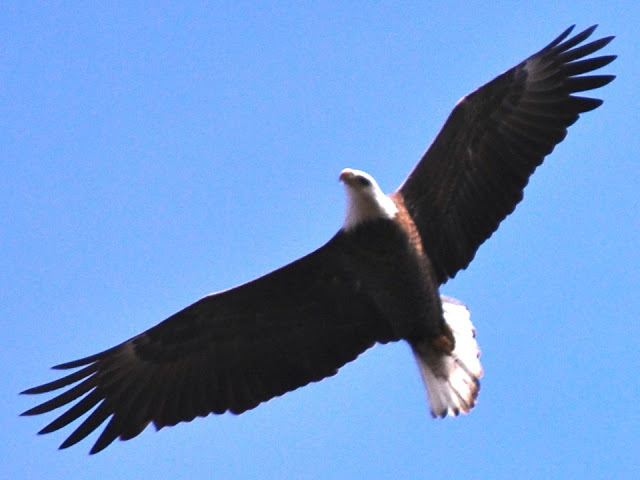 Visitors to the overlook always are thrilled when we can point out an eagle flying past us on its way to Florida or the southeast coast. By the end of the day, we had counted 3622 Broad-winged Hawks for the second highest daily total ever at Pilot Mountain – surpassed only by a 10,000-plus day more than 20 years ago. We couldn’t match those totals the next two days, but the raptor watching was pretty darn good with roughly another 800 birds on Monday and 500 on Tuesday. On that day, one Merlin zipped by at eye level in the morning, followed by a pair in the afternoon. Merlins are the least frequent visitor to the knob, and these were only ones seen this season. The day’s observers also counted all other 12 expected species of raptor/vulture. With those three days, the peak of the migration had passed. We did add slightly more than 600 birds the following week for a season total of 6247 migrants. 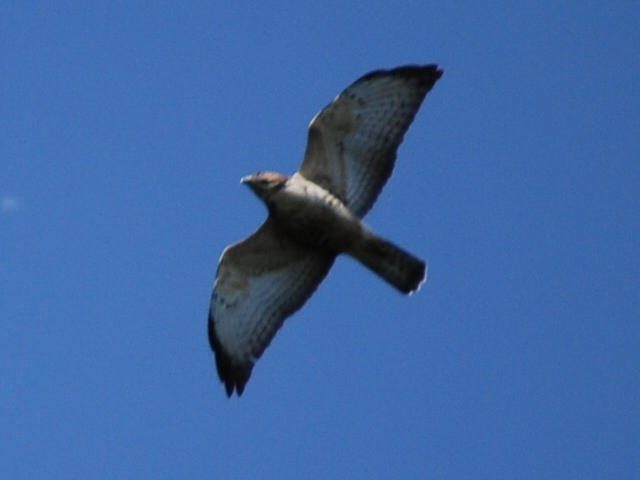 This included 6057 Broad-winged Hawks. These numbers were double what we have seen many years and our second highest seasonal tally. Blessed by good weather and dedicated volunteers, it was an extraordinary September at Pilot Mountain. Special thanks to Scott Depue, Jean Chamberlain and Carol Cunningham for their many days at Little Pinnacle both during the peaks and the slow times. And, thank you to everyone who took part. See you in 2014.